Iterator of CopyOnWriteArrayList is fail-safe and doesn't throw ConcurrentModificationException even if underlying CopyOnWriteArrayList is modified once Iteration begins because Iterator is operating on a separate copy of ArrayList. Consequently, all the updates made on CopyOnWriteArrayList is not available to Iterator (see Java Fundamentals: Collections). In this Java Collection tutorial we will see What is CopyOnWriteArrayList in Java, Difference between ArrayList and CopyOnWriteArrayList in Java and One simple Java program example on How to use CopyOnWriteArrayList in Java. 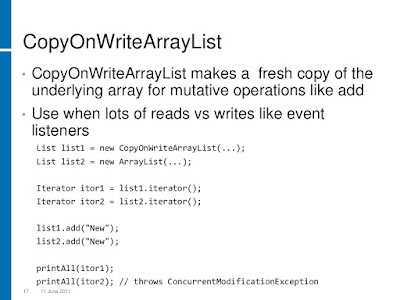 Difference between CopyOnWriteArrayList and ArrayList in Java. In the last section, we have seen What is CopyOnWriteArrayList in Java and How it achieves thread-safety by creating a separate copy of List for each writes operation. 1) First and foremost difference between CopyOnWriteArrayList and ArrayList in Java is that CopyOnWriteArrayList is a thread-safe collection while ArrayList is not thread-safe and can not be used in the multi-threaded environment. 2) The second difference between ArrayList and CopyOnWriteArrayList is that Iterator of ArrayList is fail-fast and throw ConcurrentModificationException once detect any modification in List once iteration begins but Iterator of CopyOnWriteArrayList is fail-safe and doesn't throw ConcurrentModificationException. 3) The third difference between CopyOnWriteArrayList vs ArrayList is that Iterator of former doesn't support remove operation while Iterator of later supports remove() operation. If you want to learn more about collections, I suggest you go through Complete Java MasterClass, one of the best Java course on Udemy. Here is a complete code Example of CopyOnWriteArrayList which demonstrate that Iterator of CopyOnWriteArrayList doesn't support remove() operation. * doesn’t support add, remove or any modification operation. That's all about what is CopyOnWriteArrayList, the difference between CopyOnWriteArrayList and ArrayList in Java and an example of CopyOnWriteArrayList. In short, use CopyOnWriteArrayList if you mostly require to Iterate over list without modifying it. Thanks for reading this article so far, if you like this article then please share with your friends and colleagues. If you have any feedback or questions then please drop a note. Good Explanation! Easily understandable.helpful. thanks! Why it is not giving Concurrent Exception? After removing element you will not iterate over array, because iterator.hasNext() will false. 1. i need to understand internal implementation of CopyOnWriteArrayList if you have something please post it. 2. why remove operation is not supported by CopyOnWriteArrayList Iterator. There is any logic behind that. @manav CopyOnWriteArrayList uses cloned object for thread safety so for each thread it will create separate copy of COWAL and later on JVM merges this copy with the original one.So if remove operation was possible you could remove say element "A" from first cloned object but this "A" elenent will be still present in the other copies. Merging would update element "A" again.So remove operation does not make sense so it is not used for COWAL. Yes, that's good idea, will put an example as well, thanks. Second difference between ArrayList and CopyOnWriteArrayList is that Iterator of ArrayList is fail-fast and throw ConcurrentModificationException once detect any modification in List once iteration begins but Iterator of CopyOnWriteArrayList is fail-safe and doesn't throw ConcurrentModificationException. Sorry, can you elaborate please? Yes I also got the same doubt. Purpose of going for **CopyOnWriteArrayList** is as it supports mutation operation e.g. add, remove, or update while iterating through it RIGHT ? But your example contradicting, by stating that it will not support remove() operation. Please correct me if my understanding it wrong. I request you can you please put some more light on it, to clarify the doubt. Its correct. CopyOnWriteArrayList itself supports the remove method. However, the iterator to a CopyOnWriteArrayList does not support the remove() method and consequently throws the UnsupportedOperationException.